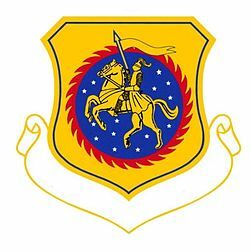 The 452d Operations Group (452 OG) is the flying component of the 452d Air Mobility Wing, assigned to the United States Air Force Reserve. The group is stationed at March Air Reserve Base, California. During World War II, its predecessor unit, the 452d Bombardment Group (Heavy) was an Eighth Air Force B-17 Flying Fortress unit in England, stationed at RAF Deopham Green. 1st Lieutenant Donald J. Gott and 2nd Lieutenant William E. Metzger, Jr were both awarded the Medal of Honor for their heroic actions. The 452 OG mission is to organize, train and equip aircrews to provide air refueling and strategic airlift any time, any place. The Group's aircraft operate under widely varying situations ranging from small movements in battle to large movements over long distances. Ground unit left for Camp Shanks New York on 23 December 1943 and sailed on the Queen Elizabeth on 2 January 1944, and arrived in Clyde on 8 January 1944. The air echelon began overseas movement in early December 1943 via the southern ferry route. Most of the aircraft reached England a few days before the ground units arrived. The 452d was assigned to the 45th Combat Bombardment Wing, and the group tail code was a "Square-L". In addition to strategic missions, the 452d supported ground forces and carried out interdictory operations. Helped prepare for the invasion of Normandy by hitting airfields, V-weapon sites, bridges, and other objectives in France. The group struck coastal defenses on D-Day, 6 June 1944. Bombed enemy positions in support of the breakthrough at Saint-Lô in July and the offensive against Brest in August and September 1944. Later in September, assisted the airborne attack on the Netherlands. Hit enemy communications in and near the combat zone during the Battle of the Bulge, December 1944 – January 1945. Bombed an airfield in support of the airborne assault across the Rhine in March 1945. The group received a Distinguished Unit Citation for action on 7 April 1945 when, despite vigorous fighter attacks and heavy flak, it accurately bombed a jet-fighter base at Kaltenkirchen. The 452d Bomb Group flew its last combat mission of World War II [in Europe] on 21 April, striking marshalling yards at Ingolstadt. Redesignated 452 Bombardment Group, Very Heavy on 11 March 1947. Activated in the Reserve on 19 April 1947. Redesignated 452 Bombardment Group, Light on 27 June 1949. Trained as a bombardment group under supervision of the 2347th Air Force Reserve Training Center. Ordered to active duty effective 10 August 1950 for duty in the Korean War under the 5th Air Force. Moved to Japan, October–November 1950, and entered combat with B-26 Invader light bombers against communist forces late in Oct, operating first from bases in Japan and later from South Korea. Flew armed reconnaissance, intruder, and interdiction missions, and provided support for ground troops. Bombed and strafed buildings, tunnels, rail lines, switching centers, bridges, vehicles, supply dumps, and airfields until May 1952 when its mission was taken over by the regular USAF 17th Bombardment Group (Light). The group received two Distinguished Unit Citations (Presidential Unit Citations)for its actions during the Korean War. 731st Bombardment Squadron (7D): 1 June 1943 – 28 August 1945; 12 July 1947 – 25 June 1951 (detached November 1950-25 June 1951). 733d Bombardment Squadron: 16 November 1957 – 14 April 1959.